Merry Christmas from Unite the USA! 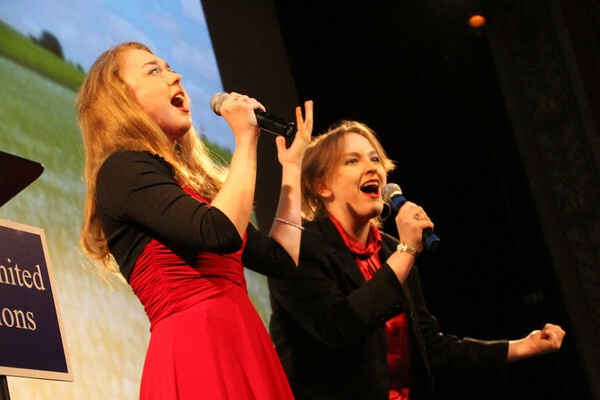 Above: Stacie & Carrie sing "In God We Still Trust" for Governor Mike Huckabee's pro-life movie premiere: The Gift of Life. 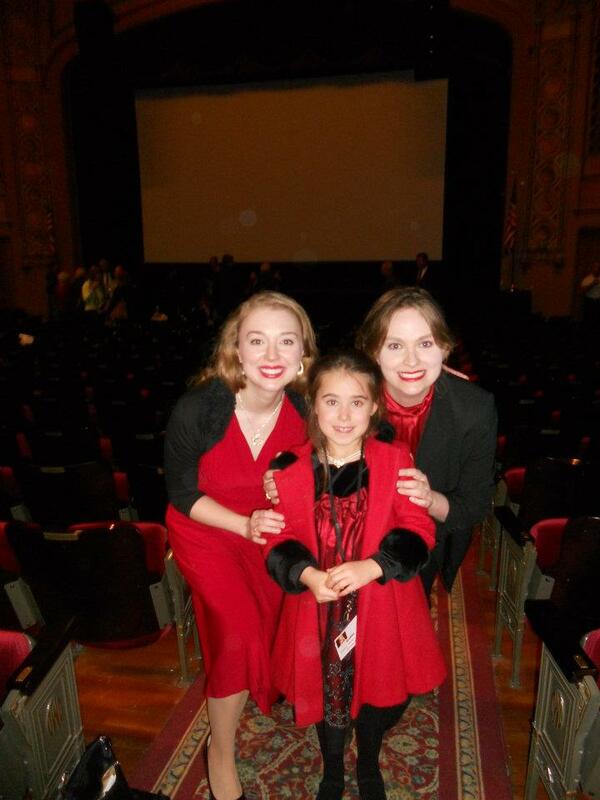 We just sang for Governor Huckabee's pro-life movie premiere with Citizens United. (See photo at left.) In this month's edition, find out how to become a pro-life pro! With resources, tips, and an inspirational article, you'll feel prepared to help make a difference. We hope to make it easy for you to make a difference. Merry Christmas! And we wish you God's best for 2012! Governor Mike Huckabee requested that I sing the National Anthem for his pro-life movie premiere event. 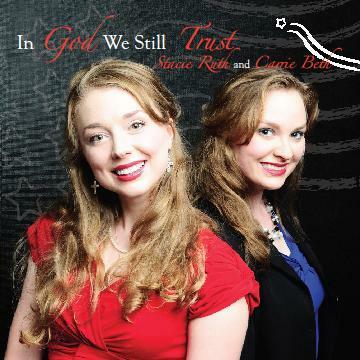 We also were asked by his team to sing our signature song from our latest album, In God We Still Trust. Prior to singing, my sister and I stayed in the green room. Little did we know what a special treat awaited us there! Eight year old Elisha Lancaster's smile sparkled more than her shiny necklace. Both matched her gorgeous Christmas dress. (See picture.) We visited and laughed so much. It lifted my heart. Elisha, one of the movie's cast members, was adopted. . . as an embryo. Yes, an embryo. As I hugged the precious child and saw her overjoyed parents, I thought, "This confronts the issue of embryonic stem cell research head-on! I can't imagine what would have happened if Elisha had been destroyed for research!" The experience so near Jesus' birthday reminded me of the miracle of His birth. Of course, it's mind-bogglingly miraculous that God sent His Son. But it's also tremendous how God worked around the government. The government didn't want the Child to live either. A slaughter of little boys ensued after Jesus' birth. Selectively, King Herod issued an order to kill all boys around Jesus' age. Such weeping and wailing rocked the homes where mothers once rocked their babies. But God provided a way to save Jesus from death so that He could save us by living as an example, dying, and rising again to conquer sin and death. "Now after they had gone, behold, an angel of the Lord appeared to Joseph in a dream and said, Get up! [Tenderly] take unto you the young Child and His mother and flee to Egypt; and remain there till I tell you [otherwise], for Herod intends to search for the Child in order to destroy Him" (Matthew 2:13, AMP). Today, the United States government issues an order against many babies' lives. How? By funding abortions. Planned Parenthood receives much money from taxpayers. And they don't help people plan parenthood. They plan baby-killing. Startling statistics reveal a tendency in our country of selective killing: In a recent LifeNews.com article[i], a similar statistic sends shudders: Only 10% of Down syndrome children get a birthday. 90% are killed in utero. (Other countries are paving the way for abortion acceptance: In China, millions of baby girls get killed in the womb because they're not boys.) Approximately 54 million Americans aren't enjoying America because they were killed while in the womb. Today, childless parents struggle to find children to adopt in America because so many of such adoptable children have been killed before they could be rocked and treasured. A poor Middle Eastern teenager carried her child to term so that He could carry and conquer the burdens of sin and death. Today, results of sin and death include abortion. And Jesus desires us to abort abortion and embrace loving everyone. This Christmas, I believe Jesus desires us to cry out for the babies that never cry. He loves babies. He even came as one. Near Jesus' birthday, we encourage all expectant moms to give their babies birthdays. And, whether a woman has had an abortion or not, God loves each woman and offers a fresh start in faith. Today, throughout America and the world, millions upon millions of babies never breathe. They're killed before they can cry. Today, some people say, "It's a fetus. It's not a person." Well, no "tissue" becomes a person. The fetus is a baby. Yes, a baby is a person. And even embryos deserve to be adopted. Jesus loves babies. He alone knows most what babies feel. He came as one. But the devil hates life and, even when Jesus arrived, unleashed a killing spree (approved by the government) to kill the little boys (two years old and younger) in Bethlehem and its districts. This Christmas, we cry out for the babies that never cry. Abort abortion. Life isn't a "choice" to make. Life must be the only option. Abortion -unborn baby killing- hurts the heart of God. He creates each child with tender, loving care. And He loves each mother-to-be and welcomes every woman who has had an abortion to get a fresh start with new birth in faith. Baby Jesus, born to an unwed, impoverished mother, shattered the darkness of a night in a tiny town...and the world. (Let Jesus into the inn of your heart. Go to www.prayingpals.org/knowgod.) And will you help unborn babies survive and thrive? The real choice remains: Will you passively live while preborn babies get killed? Or will you do something lovingly and positively helpful to rescue the children of tomorrow? Many Elisha's need to be born. Become a pro-life pro. Tomorrow's children will thank you. Get Active: Click on the links to the right of this article to get started to help stop abortion! 1. Pray for unwed mothers and support ministries that aid them. a very informative video about the truth about Planned Parenthood. 4. Encourage adoption in your community. Write letters to the editor. Talk with your pastor about ways to reach out. 5. Consider sharing about Elisha's parents' mission to help others learn about embryo adoption: http://embryoadoptions.wordpress.com/about-us/the-lancaster-family/. Through inspiring firsthand accounts and expert analysis, we hope this film will give you a better appreciation for The Gift of Life.